Have you noticed how many Christmas novels and novellas release every fall? Inspy Romance author-bloggers have contributed to probably half a dozen Christmas box sets and released a whole bunch of single titles, as well. Check the BOOKS tab to see if you’ve missed any! In October, I blogged here about the first book in my Christmas in Montana Romance series, More Than a Tiara. In November, I turned my blog post over to Bren, the heroine of Other Than a Halo, the second Christmas in Montana Romance. I decided that was enough about my own Christmas stories on this blog, so I dug through the Christmas stories I’ve been reading lately to see if there were any that stood out to me. 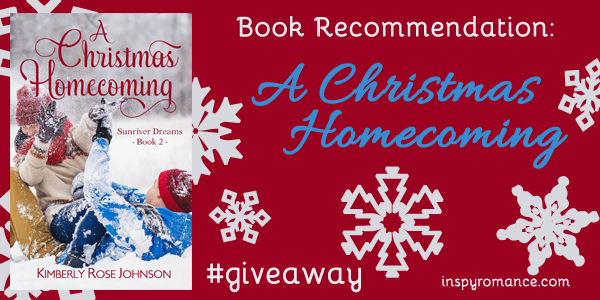 A Christmas Homecoming by Kimberly Rose Johnson, one of our Inspy Romance authors, is one such book. I’ve been a fan of Kimberly’s since her first Wildflower B&B romance, Island Refuge, in spring of 2015. (Psst, click the link! It’s FREE today! )A Christmas Homecoming is the second book in her new Sunriver Dreams series. Like many Christian contemporary romance series, it’s helpful to read the books in order, but isn’t completely necessary. Note from Kimberly: Currently A Love to Treasure, the first book in the series is FREE! Sunriver is a resort community near Bend, Oregon. I haven’t ever been there, but it’s a real place, and I’m not sure how much Kimberly has adapted the town for use in her own stories. Knowing it is actually on the map definitely helps explain the solid sense of setting that Kimberly brings to this series. I love Christmas stories that take place in a winter wonderland. The hero of A Christmas Homecoming, Stephen Belafonte, may not agree. His entrance to the story takes place when his truck slides off a snowy road and crashes into a pine tree. Of course, the first person on the scene is the heroine, Bailey Calderwood, who just happens to be the interior design assistant of Stephen’s mother, the owner of Belafonte Design and Construction. Stephen, a widower, has been in Paris for the past several years. Now that his mom has had a stroke, he’s decided it’s time to return home and take his place in the family business. The first task assigned by his mother is to fire Bailey, but why, when it is obvious that Bailey is talented and is dedicated to the business? Enter a bit of intrigue, a secret admirer, precocious children (Stephen’s niece and nephew), snowball fights, Christmas tree decorating, shopping, and friends as a foundation to this delightful Christmas romance. If you haven’t picked up A Christmas Homecoming yet, what are you waiting for? A giveaway? Okay, fine! I’ll give away one E-BOOK copy of A Christmas Homecoming OR one of my own Christmas books (Merry Kisses, More Than a Tiara, or Other Than a Halo), winner’s choice, to one person who comments by Friday evening, December 16. The winner will be announced in the Sunday Edition on December 18. To start the conversation, what makes a Christmas romance story a memorable read for you? Of all the Christmas stories written and published by Inspy Romance authors, which stands out to you? Thanks for the recommendation, Val! I enjoyed the blurb and I love the cover of Kimberly’s book. Gosh, I can’t keep up with all of the holiday novellas. Of course I don’t really need to read Christmas stories during Christmastime, but they “taste” so much better during this happy season. Like Merry Kisses, I’ve had it for a while, started but never finished.. I just wasn’t in the mood for a Christmas story.. then recently I read it and loved it. Merry Christmas Valerie! Thanks for the recommendation. A Christmas Homecoming is on my wish list. I enjoyed your book More Than a Tiara. Started reading Other Than a Halo, but have not had time to finish reading it. Maybe after Christmas, since the next few weeks will be busy with Christmas activities and my grandson’s birthday. Even though I never thought I would say this, due to the many affordable and interesting Christmas boxed sets released early fall, I am read out. So I am taking a break. A memorable Christmas romance has an inspiring Christmas message, believable couple, some children, an unusual pet with a beautiful snowy setting (living in the Midwest, snow is a most). I do understand how a person can be “read out.” Halo will be waiting for you when you come back! I keep missing out on the “unusual pet” part. Except for Eden’s goat in Secrets of Sunbeams, but then, that wasn’t exactly a Christmas story! Valerie Comer, the unusual pets are not your average house pet, but they have a connection with people. Two of my favorite animal included romances this Christmas season are: # 1 – Aubrey Wynne’s Chicago Christmas Romance Paper Love includes a stray carrier pigeon named Charlie and 1000 paper cranes. Based on a true romance, an inspiring captivating read. This romance is a stand alone, but was first published in Christmas Pets and Kisses 2 – 12 Sweet Romances. #2 – In the boxed set Mistletoe Kisses and Christmas Wishes Kathleen Freeman’s romance Cephalopod Cupid were Seattle Aquarium Marine biologist Lacey McDowell has an escape artist octopus named Gabriel. Cephalopod Cupid was not only a delightful read, but informative about octopi. Oh how fun! I can see why those would stick in your mind! The recommendation sounds interesting . I like a story that starts with a hero/heroine jumping in to save someone who is needing help. I’ve been surprised by the number of Christmas box sets. I read a few and enjoyed them. That’s a good point, Diana. When a character jumps in to help someone right at the beginning, that gives a favorable impression to the reader as well as to the soon-to-be romantic interest! Thank you for featuring my book, Valerie! I am touched and very happy you enjoyed it. Just so everyone knows, my Sunriver Dreams series are short novels, not novellas. You’re welcome, Kimberly! And OH, good point about the free book. When I saw it was free, all I thought was that I’d already read it. I should edit the post so those who come later see. Thanks for the recommendation Valerie :) It looks like a fun read. I’ve read your two books, More Than a Tiara, and Other Than a Halo just recently and totally enjoyed them. I’ve also read Kimberly’s Sunriver book series which I LOVE and she really captures Sunriver and the Bend, Oregon area beautifully! I’ve also enjoyed getting to know Kimberly. She is a sweet lady and I find we have lots in common. As for Christmas books, I find this year I’ve been reading A LOT of Christmas books and there are just so many good ones out right now I can’t pick just one! Thanks so much! I’m delighted to hear you loved the Christmas in Montana stories. I’m not familiar with Kimberly’s part of Oregon. I’ve been up the coast and across on I-84 but that’s about it. Although I love the ocean, so I didn’t feel like I was “settling” LOL. Valerie, thanks for highlighting Kimberly’s book. I hadn’t yet heard about it. And thanks for the heads-up on the two freebies. It’s hard to find the really good ones in the midst of the “free kindle books” when a search is done. That makes six in a row of Kimberly’s books I’ve read and enjoyed, and zero I haven’t. I’d say you’re in good hands! Have a great week, and enjoy those two freebies! Thanks, Valerie! I love hearing recommendations like that. :) Hope you have a great week too! I just got “A Love to Treasure” but haven’t had time to read it yet. I’ve been reading quite a few Christmas novels/novellas, so at the moment they’re all kind of blurred in my mind :-) Thinking about it, however, reminds me that I read Carol Moncado’s “Manuscripts & Mistletoe” and am supposed to review it, but haven’t yet! Yikes!! There are a few that stand out for me, but you’re right. I’ve read others that were pleasant enough/interesting enough to finish but didn’t leave me thinking about them for long. Doesn’t mean the time was poorly spent! There always needs to be romance but also just like some of the Christmas movies I watch, a character a bit cynical about the holiday and another that is totally sold on Christmas and all the trimmings. I love when hearts are changed. The reason for the season. To put you on the spot… have you read my novella Merry Kisses? It came out in 2015. She thinks the Santa thing is just lying to children… and he is the mall Santa. I had fun with that! I haven’t read it yet but it’s on my Kindle. I’ll need to get on it! Great article and recommendation, Valerie. And in case anyone is interested, A Christmas Homecoming is on sale for only .99 today, tomorrow and Wednesday. Maybe you could add a note or something? I guess that I really am not too concerned with the details for a good Christmas story. Mostly all I am really looking for, is something where the main characters are considerate and kind. It really comes down to just having the “feel goods” at the end. If an author can take me there, then perfect! I will say that I really dislike it when the main character seems to be too blue. I don’t want to read that right before Christmas. Anyway, Merry Christmas and may your new year be rockin’ ladies! I agree. I want a romance that pushes the buttons to make me feel good. There are assorted buttons or combinations of buttons that could take me there! Merry Christmas! The best, nonChristian inspirational Christmas story I’ve ever read is: “Twelve Days (The McRaes Series, Book 1 – Sam & Rachel)”, by Teresa Hill! Everyone can read the eBook FREE from Amazon & Barnes&Noble (NOOK). Val–Thanks for the recommendations. ) I love holiday romances—the vibe–the time of year–the expectation of a happy ending–all of these make for great holiday reads. Holiday reads are fun all year long. They are “feel goods”! Of course they are HEAs too! Happy holidays to you and your family, Valerie!! I like romance God’s way in ANY book, regardless of it being set in Christmas time or not :-) As long as it’s well written, it’s memorable to me. Maybe the holidays bring out that extra-special bit of sparkle!